These kits are intended for the DIY jet boaters. Offered in various stages of completion, our base kits give all the components necessary for new engine installs, relocation or swap. These kits are priced to offer a superior engine mounting solution as an alternative to the conventional 3 or 4 point '60's mounting technology. 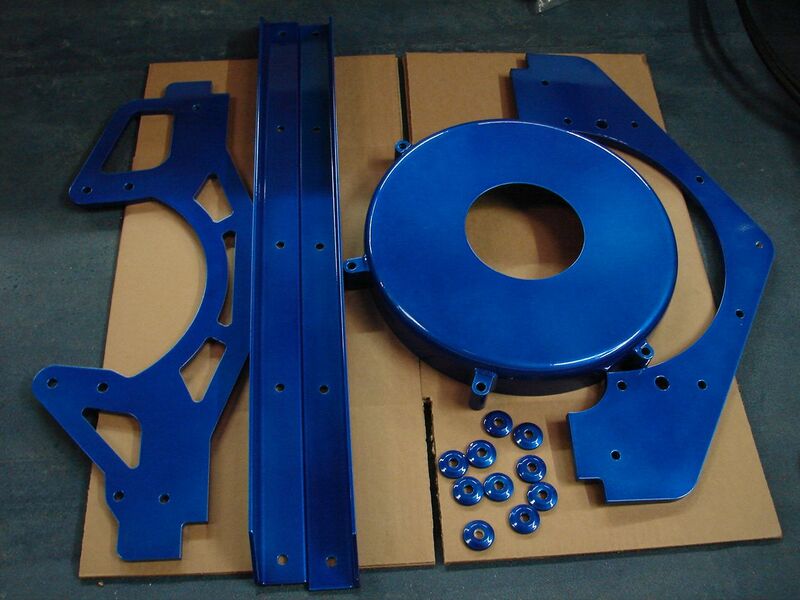 Base Kits come complete with Front and Rear .375" thick Mounting Plates, (4) Fabricated Corner Blocks, (2) 36" 2"x2"x3/16" Angled Rails, (10) Stinger Washers, Second Generation JBP Spun Aluminum Flywheel Cover(seen below), and a complete stailnless hardware package. Polished Aluminum Rail Engine Mount Kit, Includes Rails, Backing Plates, Blocks Engine Plates, Bellhousing, Drive Line Cover and Stainless Fasteners. Available for BBC, SBC and BB Ford. Also available with top mount starter option.